Ethanol can be made by a dry mill process or a wet mill process. The process of producing ethanol, whether it’s beer, wine, whiskey, or fuel ethanol, is dependent on yeast, a single cell organism. Yeast consume sugar and produce heat, carbon dioxide, and ethanol when in an oxygen free environment. An ethanol plant converts the starch of the corn kernel back into sugar, adds yeast, and then separates out what’s left. 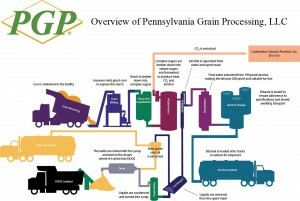 At Pennsylvania Grain Processing, we grind over 100,000 bushels of corn a day. Half of the corn arrives on trucks, purchased from farmers and grain elevators in western Pennsylvania and northeast Ohio. The other half arrives by rail. Trains are loaded in western Ohio, Indiana, and Illinois. To begin the process, hammer mills grind the corn into a flour. Water and enzymes are mixed with the corn flour. One of the enzymes is alfa-amylase. On a side note, humans produce alfa-amylase in their saliva. The mixture, called slurry, is heated to speed up the enzymes’ work of breaking the starch into sugars. After the enzymes have completed their work, the mixture is pasteurized to kill any harmful bacteria. Yes, just like milk. This is a biological process and we don’t want our fermentation vats to get an infection! Next, the slurry goes into the fermentation vat and yeast are added. Our vats are 800,000 gallons. For approximately, two days the yeast work their magic. Each vat has an agitator and a heat exchanger. The agitator mixes the mash, so all of the sugar is available to the yeast. Since the yeast produce heat, the heat exchanger cools the mash to the ideal temperature. If the mash get too hot, the yeast will stop working. Periodically, the mash is checked for pH, alcohol content, and yeast cell counts. This helps us ensure a good yield and identifies any potential problems, so corrective action can be taken. Once fermentation is complete the mash is now called “beer” and is about 14% alcohol. During fermentation, the carbon dioxide is captured. Once fermentation is complete, a 56 pound bushel of corn will produce about 2.8 gallons of pure alcohol, 18 pounds of dried distillers grains, and 18 pounds of carbon dioxide. Roughly, it is one-third alcohol, one-third distillers grain, and one-third carbon dioxide. First, we distill off the alcohol from the beer – water, corn solids, and yeast. Since alcohol boils at a lower temperature than water, it boils first. Our distillation process produces 95% pure alcohol or 190 proof. To produce pure, 200 proof alcohol, we use a molecular sieve, so extract the last 5% of the water. The pure alcohol is transferred to storage tanks and ready to be shipped. After the alcohol is removed, the water and corn solids is called stillage. The stillage goes through a corn oil separator, which is similar to a cream separator. About three-quarters of a pound of corn oil is removed per bushel of corn. Next the stillage goes through a centrifuge to remove the water from the corn solids. The water is condensed into a syrup. The syrup is added to the corn solids and dried to produce Dried Distillers Grains with Solubles or DDGS. In about three days, corn is processed into pure ethanol, corn oil, dried distillers grain and carbon dioxide. The ethanol is sold to gasoline blenders and retailers and is shipped to gasoline blending facilities in Pennsylvania. Ethanol is added to gasoline to boost the octane and reduce the emissions. The corn oil is feed-grade. It is used to add energy to poultry diets. A secondary market for corn oil is biodiesel production. DDGS is a high protein, high fiber animal feed. At PGP poultry, is the largest consumer of our DDGS. It is also fed to swine, dairy cattle, beef cattle, and horses. The corn oil and DDGS is shipped to farmers and feed mills in Pennsylvania and the Mid-Atlantic States. The carbon dioxide is piped to Continental Carbonic Products, Inc., which built a plant beside PGP in 2017. They refrigerate the CO2 gas into a liquid. By using a vacuum, the liquid is converted into a snow, which is pressed into a solid block of dry ice. The dry ice is cut into custom sizes and ship to food processors, grocery distributors and next-day food shippers.